Welcome to Marvel Strike Force Minions page. This is the full description of MSF S.H.I.E.L.D. Security stats, skills, and abilities. 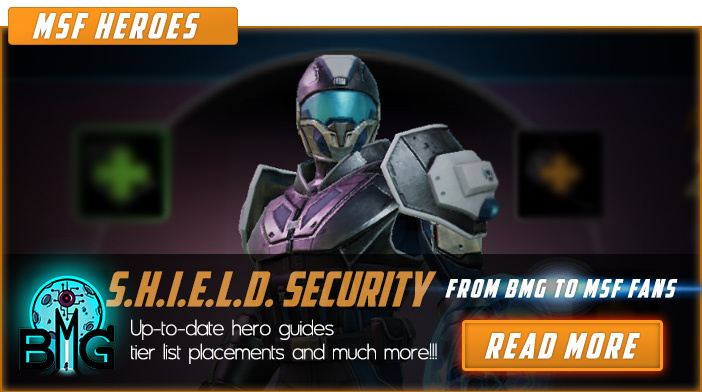 In Marvel Strike Force, S.H.I.E.L.D. Security is a S.H.I.E.L.D. (Strategic Hazard Intervention Espionage Logistics Directorate aka S.H.I.E.L.D. is a fictional counter-terrorism agency led by Nick Fury which employes espionage and law-enforcement in its work) minion who repeatedly uses taunt to protect his allies. S.H.I.E.L.D. Security is moderately expensive and his cost is 45 shards obtainable through orbs, arena store, and 3-6 heroic campaign mission. S.H.I.E.L.D. Security's main strength is his passive which enables him to automatically cast taunt when his allies are under 50% health. S.H.I.E.L.D. Security represents the full might of the S.H.I.E.L.D. team. Whenever the health of his S.H.I.E.L.D. allies drops below 50%, S.H.I.E.L.D. Security activates taunt and Defense Up. With a 50% block chance, he is almost in impenetrable and he will sustain any damaging skill with minimum health loss. Above all that his special ability inflicts more damage than any other skill from the rest of the S.H.I.E.L.D. team. S.H.I.E.L.D. Security is a non-lethal combat specialist with a protective shield and baton that stuns opponents. Attack primary target for 70% damage +appy Slow. Attack primary target for 90% damage + Bonus attack for 70% damage. If target has Slow, apply Stun. We hope that you enjoyed the description of MSF Minion S.H.I.E.L.D. Security. For detailed information about other MSF Characters check our MSF Minions page.